Imagine for a bit with me…. You're sitting in church. The piano player is starting the normal offertory music. The ushers are all lined up along the pews to pass the plates around to the congregation, and then a crazy man comes in and starts throwing stuff. He picks up the offering plate and hurls it at the podium. He takes wallets and throws them in the baptismal at the front of the church. Meanwhile all the members dressed in their suites and ties, try to tackle him before he destroys the sterility of their Sunday morning. Granted, the modern church has a tradition of taking an offering, and it's the modern way of tithing, which is entirely Biblical. So maybe my analogy doesn't hold true through it's entirety. But the problem is similar. How many churches have stuff they're selling to make a profit so that members can get closer to God? I know this is a touchy subject. Believe me. I've been in this conversation with many Pastors, Youth pastors, and if we include para-church ministries, even my own way of doing business needs to be examined. We provide a summer camp facility that students might come to know God in a more intimate way, and it costs. It costs money to buy boats and jet skis. It costs money to pay staff. It costs money to set up systems of enrollment, risk management, postage for birthday cards. And the churches say the same. It costs money for a piano. It costs money for carpet, paint, and building materials, not to mention all the ongoing operating costs associated with a house of worship. So how do we read this section of scripture? Are we supposed to do away with the bookstores in the church? Are we supposed to not sell services whereby people dedicate their lives to mentorship? How can we follow Jesus as He takes a bit of Spring Cleaning to the Temple? Help me, as WE follow become more like Christ in our day to day lives. Next He knew the heart of Man. I believe you’re in the right to charge for camp, and for the sustenance of the ministry – and here’s why. First, the story you mention in John is recorded in Matthew, Mark and Luke as Jesus pronouncing judgment on Israel in general and on the temple in particular. 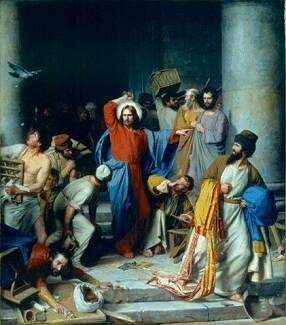 Jesus was judging the temple – not cleaning it. Note that in those accounts, Jesus said “My house will be a house of prayer; but you have made it ‘a den of robbers.” Of course, Jesus pulled the first phrase in that sentence from Isaiah 56:7 (a pronouncement of dire judgment on Israel and her leaders) and he pulled the second phrase from Jeremiah 7:11 (a pronouncement of judgement on the temple itself). So I believe Jesus was doing a whole lot more than just saying “you’re charging too much for doves!”. I believe he was pronouncing judgment on Israel and on the temple – judgment that came to literal fulfillment in when the Romans tore the whole thing down in A.D. 70. Next, though neither Paul nor any other NT author ever prescribed the Jewish tithe or any compulsory giving (10% or otherwise), Paul did take up offerings to pay for ministry efforts and/or support for distant churches. So while not putting the church “under compulsion” as in the Jewish tithe – he certainly advocated for free-will gifts and offerings to pay for ministry. You’ve made your case in this post the way I wish more Christian leaders would. You simply said, “Ministry costs money”. Any thinking person should agree. Then those that believe in your sincerity and your methods should give whatever amount they “purpose in their hearts”. STL, thanks for your note. My concern is that we blow by Jesus’ action without careful thought, and we tend to hold to our own tradition without knowing what He was doing. Thanks for saying, “Those that believe in your sincerity and methods should give whatever amount they purpose in their hearts.” It is truly my sincere desire that this be a place that can examine truth from all angles, and apply it when we see it. Thanks. You’re an encouraging voice today!